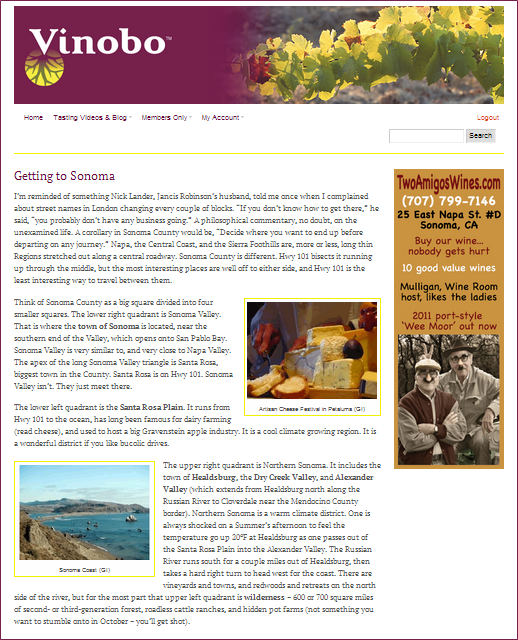 What is Bruce Cass Wine Tours? Best all-stainless Chardonnay in the business. All the wines are well-balanced and fruity, but with a track-record for bottle-aging. PN and CH from top vyds in the Highlands. Grassy SB; wonderful Riesling. As in Steinbeck’s Grapes of … Originally TX oil money. Own some 70 acres in the Santa Lucia Highlands. Friendly tasting room and some pretty good PN at modest prices. Small, well-drained, organic vyd in mountains owned by biggest shipper of organic produce in US. Fine CH, excellent ML at good prices. Very elegant, classy place. Specialize in sparklers, but have still PN andCH too. Dramatic difference between wines from vintage to vintage. Not part of the city-affiliated Tasting Walk. Three wineries in a store selling varietal olive oils and basalmic vinegars (as well as abstract art). Wineries use organic grapes, and make some nice wines. Great oil tasting. COMFORT INN Convenient on Ocean St. Clean. Motel-type. Cost about $135. PINE INN Cost about $200. CARRIAGE HOUSE INN Cost about $300. LINCOLN GREEN Four cottages a few blocks from the beach and shoreline walk in the southern part of town (15th St at Carmelo). Take the bus up Monte Verde St to downtown tasting venues. Cost about $450. L’AUBERGE CARMEL Classic. Beautiful. Wonderful restaurant. Cost about $600 for a room, and $150 per person (before wine) to eat in the restaurant. Opportunity to try several cult wines though. Carmel-by-the-Sea could charm the pants off a garden gnome. Carmel has had a full-time job for about a hundred years as spokesvillage for the word ‘quaint.’ It sits at the northern boundary of a 100-mile stretch of coastline separated from humanity, and services, by a daunting mountain wilderness. From Hearst Castle near San Luis Obispo to the Highlands Inn at Carmel, these is very little except consciousness-raising seascapes, wild hogs and two opposing lanes of asphalt. The area is called Big Sur. Two or three generations of cinematographers have all used the roadway, a motorcycle, and a helicopter to create a sense of escape from society’s restrictions. In real life Henry Miller, Jack Kerouac, Robinson Jeffers, and Sinclair Lewis all moved to Big Sur and used Carmel as the intertidal surge zone for their interaction with civilization. The village was begun as an artists’ colony, and forever forged with that image when, in 1906 after the San Francisco earthquake, they offered city lots to San Francisco artists for $10 down and whatever the artist could pay per month. Natural beauty, and an entertainingly quirky city government, have kept that image intact, even though land prices have risen sharply. There are still no street lights, nor parking meters, nor street numbers for that matter. The landscape is so striking, people talk about it being ‘touched by the hand of God’ (cf: Michelangelo’s Creation of Adam fresco on the ceiling of the Sistine Chapel). In fact Father Junipero Serra, founder of so many California missions, chose to be buried here in the chapel at the mission in Carmel. One of the features that make Carmel – Monterey – Santa Cruz so special is a gigantic canyon which runs offshore to a distance of about 95 miles. It is 12,000 feet deep (well over two miles, and capable of submerging all but a handful of mountain peaks in North America). Its effect is to bring nutrient rich cold water from very deep in the ocean to the surface near shore (smaller tributaries connect to the Carmel River in the south and the Soquel River in the north). Those nutrients attract an abundance of wildlife. The size of this canyon baffles scientists. It is much too big to have been created by the Salinas River recently. Speculation is that tens of millions of years ago (before the Sierra Nevada rose) it may have drained the Rocky Mountains (think of the Colorado River and the Grand Canyon today). If you want a souvenir of your Walking Wine Tour in Carmel, go to the City Hall and apply for a permit to wear heels more than two inches high. It’s free. They will merely ask you to sign a waiver agreeing to hold the city harmless in the event you stumble on the cobblestone streets and sustain an injury. Heels really aren’t the fashion statement you want anyway. The place is more tweedy than glam. It’s very dog friendly, and new buildings have to be erected around existing trees. Misty days are much more common than hot ones, especially in Summer. The wine Tasting Rooms are mainly clustered in a two-square-block area between Ocean Av (the primary drag downhill to the beach) and 7th (one block south); Mission St on the east and Dolores on the west. There may be as many as fifteen wineries represented, although we highlight five particularly good ones. It’s an entertaining afternoon; not a week-long retreat. The $60 Passport from City Hall ~ which pays for visits to every Tasting Room ~ is probably overkill, unless you intend to stay for a week doing one or two Tasting Rooms every evening before dinner. There is an abundance of good restaurants within a couple blocks, and a very wide choice of overnight accommodations equally close by. Pamper yourself (believe me these folks know how to do it) or select something relatively modest. Remember it’s an artists’ colony. A Bohemian attitude works here. Jack Kerouac is the hero; not some hedge fund manager from Connecticut. One Tasting Room which is outside the downtown ghetto, but well worth hitting on your way into or out of town is Taste Morgan, just across the highway. So many wineries in California are brand new. They are just getting their feet under them. Dan Lee (Morgan is his middle name), however, has had a winery in a Salinas industrial park, and vineyards in the Santa Lucia Highlands, for well over 30 years. He’s a really good winemaker whose track record for ageable Chardonnays and Pinot Noirs is unassailable. And that brings up a fascinating point: When are we going to see a terroir-driven Pinot Noir from the cool-climate district, ten-miles or so up the mouth of the Carmel Valley? There are small pockets of vines being grown there, but we rarely see them identified on labels. And, there are wineries ~ Ch. Julien for instance ~ but nobody yet claims either local provenance, nor seriously competes with Salinas Valley masters like Morgan. Finally, when having a stroll around Carmel, consider that many of the hobbit-like cottages have been in the same families for generations. There are less than 4,000 citizens in the village proper, but the local newspaper (called the Pine Cone) puts out an Internet edition with 9,000 paid subscribers. Average age in the village is a hair under 60. For every 100 females there are only 77 males. Longevity may be its own reward. A round of golf at Pebble Beach costs $500 (“Best public golf course in America”), but you can play the classic links course around the lighthouse at Pacific Grove for $25 twilight. Designed by the same guys too. Previous Previous post: New World Albariño. Hope You’ve Got a Thick Skin. Bruce Cass Wine Tours by Bruce Cass is licensed under a Creative Commons Attribution-NonCommercial-NoDerivatives 4.0 International License.